Do not use the wipers when the windshield is dry. The windshield will get scratched, or the rubber blades will get damaged. In cold weather, the blades may freeze to the windshield, becoming stuck. Operating the wipers in this condition may damage the wipers. Use the defroster to warm the windshield, then turn the wipers on. Turn the washers off if no washer fluid comes out. The pump may get damaged. The windshield wipers and washers can be used when the ignition switch is in ON . The wipers run at high speed until you release the lever. Change the wiper switch setting according to the amount of rain. Sprays while you pull the lever toward you. When you release the lever, the wipers make two or three more sweeps before stopping. The rear wiper and washer can be used when the ignition switch is in ON . The wiper operates intermittently after completing a few sweeps. Sprays while you rotate the switch to this position. 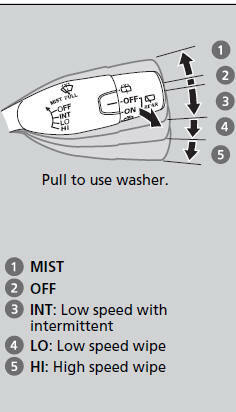 Hold it to activate the wiper and to spray the washer. Once released, it stops operating after a few more sweeps. 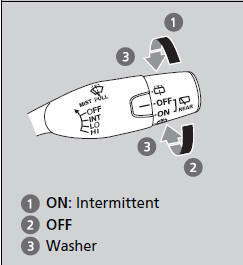 with the front wiper activated, the rear wiper operates automatically as follows even if its switch is off. If the wiper stops operating due to any obstacle such as the build-up of snow, park the vehicle in a safe place. The wiper motor is equipped with a breaker that may stop motor operation temporarily to prevent an overload. Wiper operation will return to normal within a few minutes, once the circuit has returned to normal.